Tokyo Sushi Academy | What is Edomae-sushi? The sushi commonly known around the world today is a combination of fresh raw fish, and cooked rice which is seasoned with vinegar. 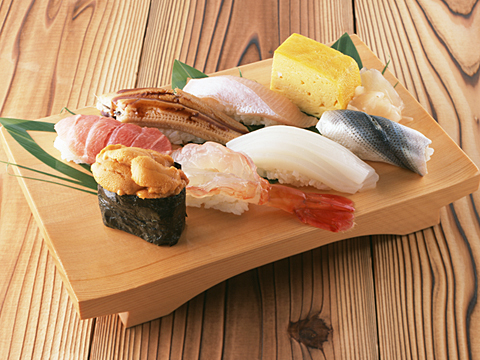 However, this is only a single variation within many other types of sushi that exist in Japan. This particular type of sushi is a rather modern Japanese cuisine initially created by the Edo (old name for Tokyo) fast food businesses during the 1820’s. The Edomaesushi, or Edomeaezushi (please refer to: “What is Zushi?“) directly translates to “Edo front”, and literally translates to Edo style. For an image please see: Sushi Stand of the Old Days. The Edo style sushi was a product of the booming Edo culture when more and more commoners were allowed to hold businesses of their own. Other famous fast foods dating back to the Edoperiod (1603- 1868) are edomae tempura, edomae soba, and edomae unagi. The Edo people were known for their busy lifestyle and lack of patience so therefore many fast food businesses became successful. Edo style cuisine are known to be saltier and sweeter compared to other cuisines in Japan. As with other types of sushi, the Edo style sushi had a lot of unique characteristics that were eventually replaced by newer ideas and methods over the next two centuries. As refrigeration technology improved, the Edo style sushi no longer became a local specialty for a city close to fishing harbors (such as Edo), and expanded to other regions of Japan, and eventually overseas. Initially, all the neta or the main ingredients were local to the Tokyo bay, such as tuna, bonito,halibut, sea eel, and shellfish; hence the name Edomae was given to this style of sushi. Althoughsashimi, or raw fish was consumed in Japan for centuries, it was the first time it was combined into one entity with Japan’s major staple, rice. 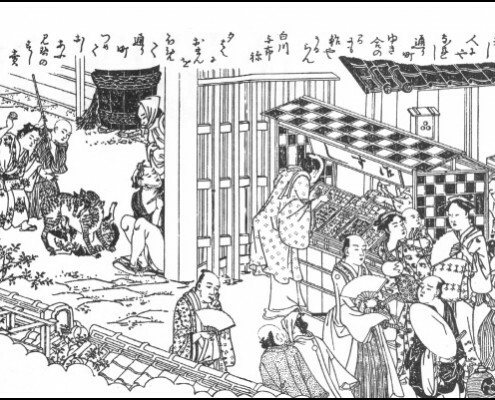 In the early days, there faced many obstacles in how to sell Edo style sushi on the streets, since raw fish spoils quickly, and it was only consumed immediately after the fish was caught. Since the sushi were prepared and sold on the streets by stands when there were no refrigerators at the time(and ice was expensive), sushi was required to have a long shelve life as possible(one afternoon at the most). Many of the early main ingredients were simmered in broth (sea eel, shrimp, and shellfish) with the exception of tuna, bonito, and halibut. It was vital to keep the raw texture of these fish, so they were immersed in soy sauce (zuke method) for a few hours so they can retain the raw texture while the sodium prevented the rapid spoiling. Other fish such as gizzard shad, andmackerel were cured with salt and vinegar since they had strong flavors that can withstand them. The vinegar in the sushi rice also prevented rice spoilage, but it enhanced the taste of the main ingredient as well. Though it was common, not all sashimi were consumed with wasabi. For example, in Edo, hot mustard was commonly used to eat fresh bonito sashimi, gizzard shad matched with shoga, or grated ginger, and halibut was frequently consumed with only salt or lighter variations of soy sauce and citrus. Nevertheless, wasabi was strictly used for Edo style sushi preparation because it has antibacterial properties. The Edo style sushi continues to evolve today as older tradtions are being broken. The Edo stylesushi always concentrated on focusing on the flavors of one ingredient for many years. This has changed after the fusion style sushi became popular in the United States, and eventually to the rest of the world. Many ingredients are mixed and blended to create new flavors in fusion style sushi. In Japan, a new wave of sushi called the sosaku sushi, or “creative sushi” is becomming popular. Creative sushi still tries to focus on one ingredient, but sometimes uses a second ingredient (which is usually foreign to Japanese cuisine such as caviar or foes gras) in small amounts to empahsize the main ingredient. The Edomae sushi was once thought to be a completed cuisene, however it has been proved to be borderless. It’s Anago Day! Foreign students tried to make sushi for the first time!